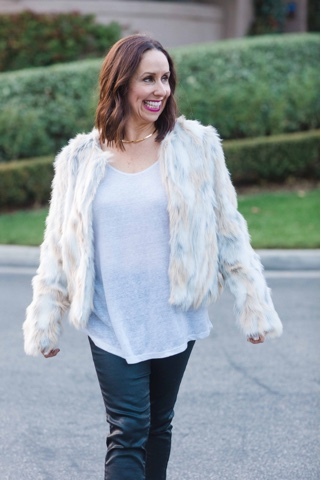 I wrote a post last week on how to dress up an outfit with a great faux fur jacket. Today I wanted to show you how to wear fur as a more casual look. I think every girl needs fur in their life!! It is an essential piece in your wardrobe, especially during these chilly months. 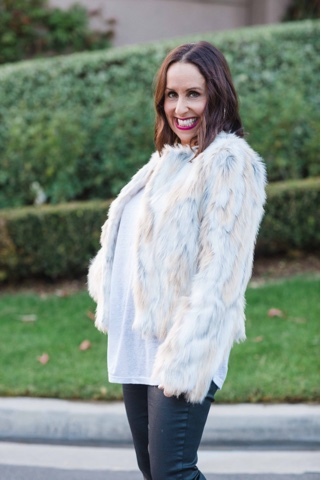 For a fun, casual look I paired this great faux fur jacket (from my friend at n:Philanthropy) with a basic white tshirt and some coated denim. Don't you just love coated denim? It gives some personality to otherwise traditional jeans. And I had to add my favorite tennis shoes, Adidas with the gold stripes (OBSESSED). Of course I completed the look with some Miranda Frye jewelry and my classic red lip. There are no if and or buts about it, faux fur is a MUST have!!! I have linked some other options above. Try out this casual look and let me know what you think. Thanks to Taylor Cole for photos and Happy Reading!!! !